Community Pop-ups. We are introducing communities to Girls Are Powerful by hosting an event in different communities quarterly. 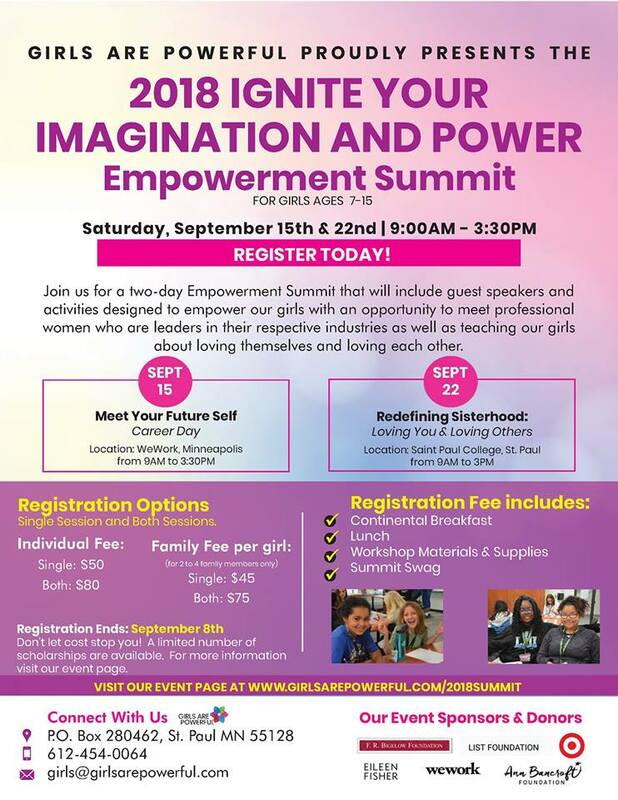 In 2018, Girls Are Powerful announced its third annual Workshop Series Summit, Ignite Your Imagination and Power through Career and Self-Exploration! Each workshop highlighted a range of skill sets and career paths to inform and energize our girls about many different professions. The workshop series concluded with a two-day Empowerment Summit on Saturday, September 15th & September 22nd from 9AM to 3PM! Day 1: Career Day – offering a fun and interactive career day experience. Day 2: Redefining Sisterhood, a self-exploration learning experience about loving themselves and loving others. Studies show that career development should begin as early as Kindergarten. Our workshop series addressed topics around career awareness and exploration as well as self-actualization and achievement. Our program content had been designed to cultivate confidence and creativity in our girls while helping them discover new interests and future possibilities. Make A Bold Statement Empowerment Summit was hosted on September 16, 2017 | Location and Time: TBD. In 2015-16, our theme is Celebrate YOU; at this event each girl has the opportunity to visit three power stations that are designed to encourage them to identify their strength, values and belief in their self. The parents are also invited to participate by attending our discussion circle. During the Celebrate YOU Event, girls have an opportunity to visit three(3) themed Power Stations where they learn more about what it means to Celebrate themselves through activity and discussion. Parent Circle: As the girls explore the different Power Stations, parents are invited to join in on the fun by learning more about the Girls Are Powerful’s mission and vision and how together we can create a Community of Empowered girls! Girl Connect Events. In an effort to keep the momentum going for those girls who have attended one of our community events or workshops, we are offering them a way to continue exploring our power words, through arts, theater, movies and other exciting activities around the Twin Cities. October 1, 2016 :: Author Connect with Abby Cooper :: Confidence starts with YOU!